14k white gold, sterling silver mokume-gane wedding bands. 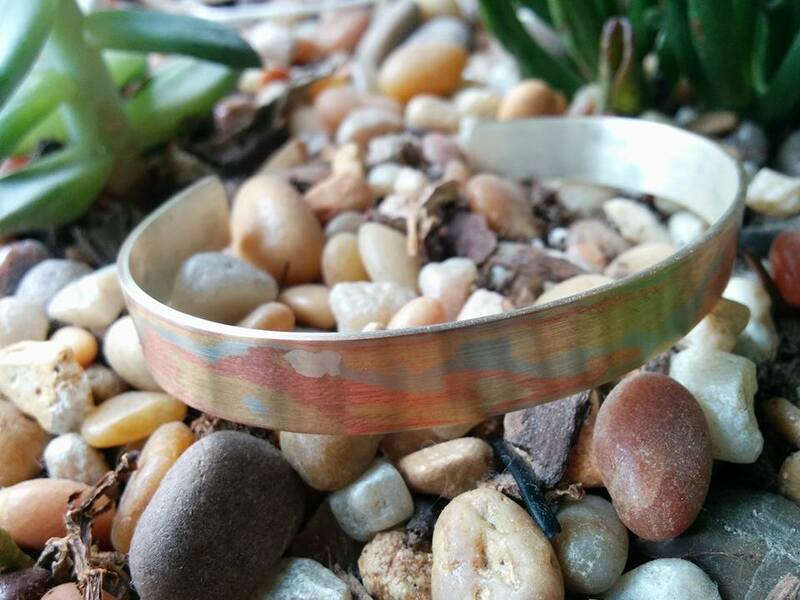 Brass, copper, nickel silver, and sterling silver mokume-gane cuff. Mokume-gane is a traditional Japanese technique, which involves fusing layers of precious metals. 14k white, 14k yellow, and sterling silver mokume-gane. Billet after fusing. (Top) 14k white, 14k yellow, and sterling silver mokume-gane during patterning. The process starts by cutting, cleaning and stacking alternating layers of thin sheets of precious metals with contrasting colors. The material is stacked and placed under extreme pressure. Heat is then applied and the metals are carefully brought to just below melting temperature. After the sheets are fused together, the billet of mokume-gane is forged into a thinner sheet. The sheet is then deformed, material is removed in certain areas to reveal the contrasting material beneath. At this point, six to eight hours later, we have usable mokume-gane sheet, to use in jewelry.